QED. I think that is what happened. I'll check wiring on dash harness in the next few days and report back. Hopefully I didn't burn up the gas gauge itself. I pulled my dash cluster out this morning and checked the wiring. I feel pretty certain that I have wire it in correctly. The B17 terminal on the original dash cluster was green with black stripe, I have it connected to the 15 pin on the new harness (from Midlife). 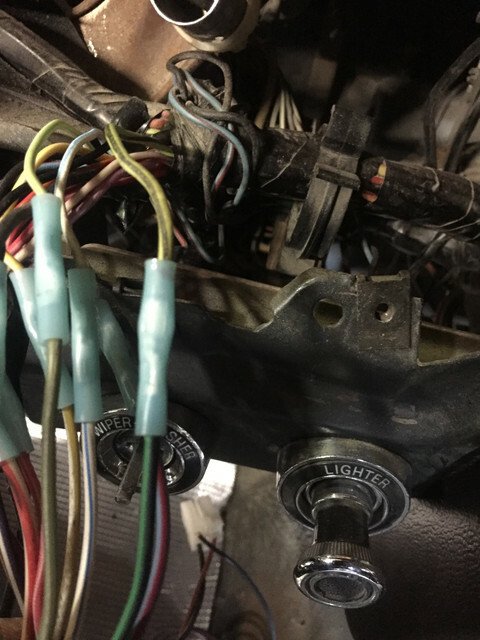 The B5 terminal on the original dash harness had 2 wires that I connected to the #3 terminal on the Midlife harness. I've attached a couple pics that I hope show the 2 connections in question. Yup, my screw-up; I can't believe I did this, considering I proof out each harness. I guess I went by wire color rather than pin-out (I'll always go by pin-outs from now on). 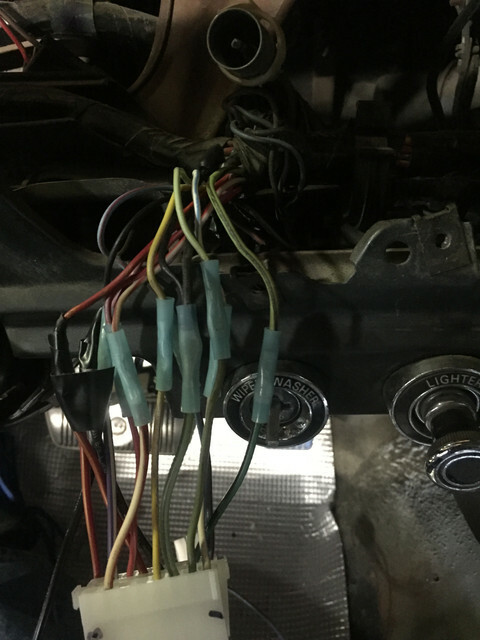 To fix this, RJPohl can either swap the pins on the dash cluster or cut his 2 splices and swap them there. My bad My bad My bad. It's good you got it sorted out, Randy, but it looks like he's going to need the practice pulling his cluster, anyway. It is just a matter of time before that black tape unwinds completely and the connection falls apart or shorts out. Sorry for being so critical rjpohl, but I've seen too many wiring harnesses fried and/or cars burned up due to bad wiring. I can only comment from my own experience, but I gave up on crimp connectors as well. I have had too many over the years that at the time seemed good, tight and strong only to have them fail later, I guess not as good as I thought. Ok for a quick fix until a more permanent joint can be made. Last summer when I installed the aftermarket center gauges, I took the time to go over the rats nest of wires a PO had left me under the dash. If only he'd at least left the unwanted plugs on and spliced into the wires instead of just cutting them off!! I solder all joints now and cover with shrink wrap of the appropriate color where possible. Sure it takes a lot of time and some frustration, but I know the joints are good and safe. I've never had a crimp connection come apart. I have good quality crimping tools and don't use harbor freight connectors (although I do have several HF tools). I get terminals from manufacturers like 3M, AMP, or Molex. I used to buy a lot from MCM, but they were bought by Newark, and I haven't tried them, even though they have a huge selection of products. I don't do as much as I used, but my supplies are dwindling. When I want extra assurance I use bare crimp connectors and solder them and insulate them with waterproof heat shrink tubing. For T connections I solder them and then use self fusing tape. With Randy’s hell I was able to get gas gauge working. Problem is with 5 gallons in tank the gauge just barely moves above empty. In the morning I will remove sending unit and bend arm down. Any one have this problem before? If so suggestions on how much to bend. I’d like to be able to do this in one try. (02-08-2019, 10:14 PM)rjpohl Wrote: With Randy’s hell I was able to get gas gauge working. Problem is with 5 gallons in tank the gauge just barely moves above empty. In the morning I will remove sending unit and bend arm down. Any one have this problem before? If so suggestions on how much to bend. I’d like to be able to do this in one try. (02-08-2019, 09:53 PM)Don C Wrote: I've never had a crimp connection come apart. I have good quality crimping tools and don't use harbor freight connectors (although I do have several HF tools). I get terminals from manufacturers like 3M, AMP, or Molex. I used to buy a lot from MCM, but they were bought by Newark, and I haven't tried them, even though they have a huge selection of products. I don't do as much as I used, but my supplies are dwindling. I would agree Don, that the better quality ones would do a better job and more reliable. However and me included, most people will just buy whatever the store is selling. I guess that is more what I was referring to. I did fail to mention in my post that I used Bullet connectors with the plastic covers removed and these were soldered on and covered with heat shrink. That way they can be taken apart if needed.